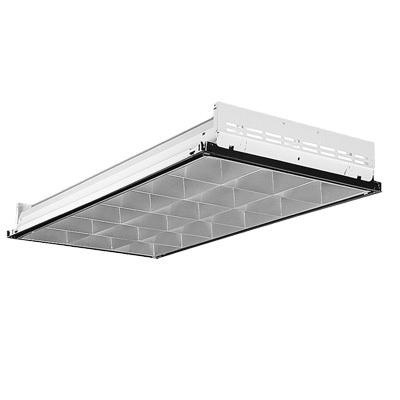 Lithonia Lighting Paramax 3-Inch Louver Family Collection Parabolic troffer in baked white enamel finish, has cold-rolled steel housing and is pretreated with 5-stage iron phosphate for superior paint adhesion and rust resistance. Lay-in grid mountable parabolic troffer uses three 32-Watt T8 lamps with 2-Pin socket. Lamp with electronic instant start ballast has voltage rating of 120 - 277-Volts. Parabolic troffer measures 48-Inch x 24-Inch x 4-1/2-Inch. It is ideal for use in open area applications and electronic offices where optical control, visual comfort and light cut-off are important. Parabolic troffer is UL listed and CSA/NOM certified.